I am counting down to Saturday and this will be my last bento for this week before we take off for our vacation. My favorite part about any vacation is trying out different restaurants and foods and yes, I love to eat and I'm not fussy about food at all. Of course I love shopping as well :) Have a happy Friday and a fantastic weekend everyone! 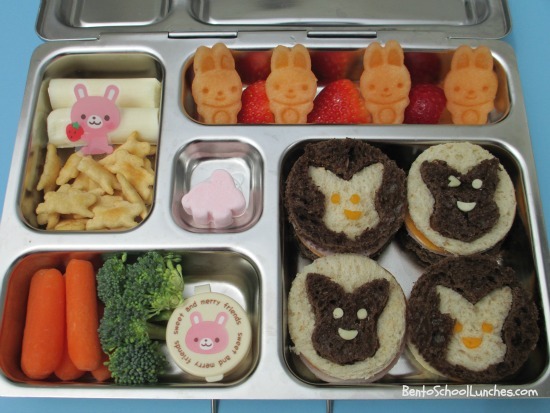 Main compartment - Circle shaped pumpernickel and wheat bread sandwiches with bunny faces. Cut round with circle cutter, then centers cut with bunny shape into top and swapped. Details on bunny faces are from gouda and colby cheese. Upper left - Mozzarella cheese stick (halved) and Annie's white cheddar bunny crackers with a cute rabbit baran. Upper right - Bunny shaped cantaloupe which I cut and stamped with my new cutter set and some strawberries. Center - Bunny shaped marshmallow. Lower left - Organic baby carrots, broccoli florets and ranch for dip in small container. Packed in Planetbox Rover. Love all the bunnies especially the stamped cantaloupe!